Recognizing the need to keep government small, PA-TEC developed a solution to the US 422 corridor that minimizes ongoing government involvement in maintaining and operating the 422 Expressway and proposed passenger train between Wyomissing and Center City Philadelphia. While the western segment of 422 may draw some residents to the Center City employment market, DVRPC and Montgomery County "planners" have not made a compelling case that a train will adequately address the congestion problems on the 422 expressway. For a train to be useful to residents of Pottstown or Royersford, the train would have to offer a one-seat ride to their final destination. The most likely place to offer this is Center City Philadelphia, which is also the most distant. Barry Seymour of DVRPC and Joe Hoeffel say their models show bi-directional traffic to places like Conshohocken and Reading, neither station has any places of interest that are within walking distance of a train station. This means shuttle buses. Ask yourself, how likely are you to drive to the Pottstown train station, park your car, ride the train to Conshohocken, board a shuttle bus, and then walk a block to your place of employment. PA-TEC believes this is an unlikely scenario. In questioning DVRPC's projected opening day ridership stat of 3,500 riders, PA-TEC asked DVRPC for the underlying data behind their predicted ridership counts. DVRPC has refused such requests made pursuant to the state's right to know law. In contrast to DVRPC's 422Sprawlbuilder, PA-TEC has developed a proposal that addresses the transportation needs of along the US-422 corridor between King of Prussia, Pottstown and Reading. PA-TEC's proposal can be implemented faster and cheaper than DVRPC's 422plus plan (formerly known as SVM). PA-TEC proposes construction of an additional highway lane in each direction along the existing length of US-422. We recommend designating this newly constructed lane as a premium lane, open exclusively to permit holders. Existing lanes on US-422 would remain free indefinitely. These lanes would be designated a FAST (Fee Accessible Separated Travel) lane, similar to other premium-lane arrangements around the country. The lanes would be demarcated with a double white line, similar to modern HOV lanes but with a fee requirement instead of an occupancy requirement. FAST lane permits would be sold through a joint effort by local townships and boroughs along the corridor. Non-residents would purchase permits through the state or county. Municipalities would use this revenue primarily as the local match for US-422 improvement projects, and secondarily to offset the impact of 422 traffic on local roads within each municipality. The proposal does not require any driver to pay a toll at any time to use the existing four lanes. It does not create a “Tolls-for-Trains” scenario and does not create a new, wasteful, governmental authority. The proposal involves local municipalities in revenue collection, use, and distribution. Lanes previously paid for by taxpayers remain free to use as they were intended. The proposed permit system does not require the use of license plate tracking. PA-TEC believes this simplified approach is a better value for taxpayers, municipalities, and drivers alike. For more information, contact PA-TEC by email: info@PA-TEC.org. PA-TEC proposes implementation of intercity rail service, operated as an Amtrak line, between Wyomissing (near Reading) and 30th Street Station, in Philadelphia, with alternate trains continuing on to either Philadelphia International Airport or New York City. Service should be similar to Amtrak's successful Harrisburg Line with (6) round trips per day. Service will operate with minimal stops to keep costs down and provide the fastest service. Additional stops can be added as needs arise and funding becomes available. PA-TEC does not recommend constructing this line as a commuter rail service, as the long distance will discourage use by the relatively limited number of Reading-Philadelphia commuters. This will lead to high costs and poor service. Instead, we believe the best use of this line will be as an intercity service, connecting occasional riders directly to Center City Philadelphia, Philadelphia International Airport, Newark Liberty International Airport, and New York City, and indirectly to Wilmington, Baltimore, Washington, and beyond with a transfer. 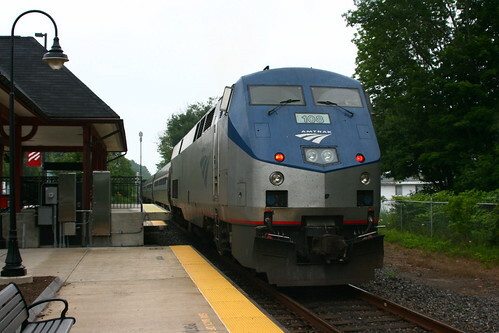 Amtrak service on this route will provide appropriate amenities for a route of this length, including reserved seating, dining facilities, and restroom facilities. Existing Amtrak equipment remains in storage as a result of cutbacks in Amtrak service over the last decade. This equipment can be brought into service quickly and with minimal investment. High quality service can be provided by Amtrak. Service can be funded by existing mass transit programs without relying on road tolls. Existing crew and equipment can be used. PA-TEC believes a simplified, responsible approach can be implemented for successful rail service along the US-422 corridor between Philadelphia and the Reading area. "The price of failure is considerable"